This grilled squid recipe here is stuffed with cheese mixture. The cheese mixture consist of tomatoes, onions, bread crumbs, green onion, cottage cheese and Parmesan cheese. When cleaning the squid, as much as possible don’t remove the head, but sometimes it is unavoidable so you just have to attach it again with the toothpick. You also have to remove the transparent cartilage of the squid and the beak by squeezing it’s head. 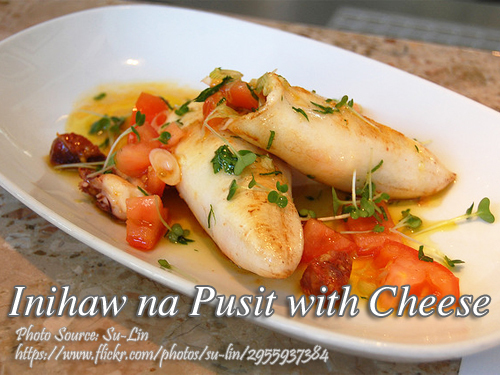 To cook inihaw na pusit with cheese; On a non stick frying pan, heat about 2 tablespoon of cooking oil. Saute 1 cup of onion and cook until translucent. Set aside In the same frying pan, add half of the chopped garlic and saute for 1 minute. Add the sauteed onions, bread crumbs, eggs, cheese, salt and pepper. Remove from heat. This will be your cheese filling for the squid. Fill each squid with the cheese filling but do not over stuff. Secure end together attaching the squid head with toothpick. Grill the squid and brush with a little oil until cooked. On a non stick frying pan, heat about 2 tablespoon of cooking oil. In the same frying pan, add half of the chopped garlic and saute for 1 minute. Add the sauteed onions, bread crumbs, eggs, cheese, salt and pepper. Remove from heat. This will be your cheese filling for the squid. Fill each squid with the cheese filling but do not over stuff. Secure end together attaching the squid head with toothpick. Grill the squid and brush with a little oil until cooked. Add in the pan half a cup of chopped onion and stir cook until translucent. Add the other half of the chopped garlic and stir cook for 1 minute. Stir in tomatoes and ½ cup water. Simmer for 5 minutes until the sauce is thick. Pour the sauce on the grilled squid in a platter.